It's Irie: Bye Bye St. Martin, Hello Martinique! After 4.5 months in St. Martin, Mark and I were getting antsy to leave and join the big cruiser’s parade south, to safer waters and more pleasant environments. 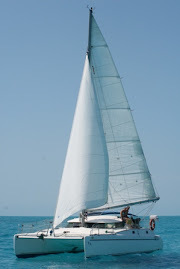 Mid June was approaching and Irie was about the only cruising boat left in the lagoon, where all the other sailboats were slowly turning into “temporary residents”. But, we couldn’t leave yet. Not as long as our rigging project wasn’t totally finished, not as long as we hadn’t received all the packages for The Wirie and personal use… Luckily, the weather hadn’t been cooperative to head south either, so we didn’t have to feel too bad about missing out on a departure yet. The weather forecast had some northeasterly winds in the coming week or so and we started to prepare our departure, while frantically trying to locate a professional rigger to tune and check all the wires and fittings. So far, we had been unsuccessful, going from a rigger on the French side leaving us with a bent mast, to presumably straightening it all back out ourselves on a hot Saturday, to having another so called expert tweak it all out of shape again. A more detailed report about this massive rigging project will follow in the near future. Mark and I rented a car to provision and pick up heaps of packages and we buzzed around collecting some diesel and necessary boat parts. We kept a close eye on the weather predictions and everything favorable had moved forward, quite a bit, all of a sudden! To make and take this one and only weather window, we would have to leave… the next afternoon. Our bodies and minds spun in an even higher gear and I started driving around the French and the Dutch side to locate a professional rigger, while Mark tried to wrap up some business stuff for the next few days. When Thursday came around, we whole heartedly hoped that the booked riggers would show up in the morning, our only chance of leaving that day. I picked up a few items on shore and bought 24 gallons of water, Mark dealt with a WirieAP customer and to my biggest relief, two extra men were on Irie’s foredeck when I returned around 11am. Our standing rigging was adjusted, the mast straightened out and before noon, the biggest weight fell off our shoulders. I ran back to the French side to check out of the country, buy dinghy fuel and swing by Shrimpy. After a quick lunch we sold our mooring ball, ran to the grocery store for a week’s worth of food, made sure our friend Ed’s boat was OK and paid our rigging bill. Before we knew it, 4pm arrived, and we headed for Simpson Bay Bridge after a fast scrub of our underwater keel cooler and log. At 4:30pm, we said “goodbye” to St. Maarten/St. Martin. We were very happy to finally be “outside”, but felt a bit rushed and sad to not have been able to say goodbye to friends we might never see again. The weather forecast called for 48 hours of east-northeast winds at a speed of around 20 knots, which is on the strong side for a trip heading southeast. We didn’t have much choice, since northeast and even east winds are rare this time of year and we had a deadline/family to meet in Martinique at the end of the month. This was the first time we consciously set out in relatively strong winds and this was also the first time we would cover a distance greater than 80 miles or longer than 20 hours. We were shooting to sail “straight” (without hitting any islands along the way) to Martinique, a distance of 250 miles and an expected 42 hours to windward. Our friend Angie on SV Kibe followed us through the Dutch bridge and hoped to reach St. Lucia a few days later. The following day went by pretty fast, with hours of rest for both of us, plenty of speed and progress between the islands and a struggle to keep moving in the lee of Guadeloupe. I was in charge of Irie during the calm periods, while Mark took care of her on the passages. For a moment we hoped to pull into Dominica for the night, but the >1 knot of current against us, made our progress over the ground much slower than over the water. With a reef in, we were still doing 6-7 knots, losing 1 knot to the current. By the time, we approached the lee of Dominica, it was 10pm and we decided to continue, dodging many container ships in the shipping lanes, 5 miles off shore. Thank you, AIS! The passage between Dominica and Martinique was a rough one again. The sea was a bit more regular, but the wind was howling above 25 knots, constantly. Mark wanted to take a long night shift again and with two reefs in the main and a reefed jib, we were doing 8 knots… With 1 knot of current against us, still. Our new rigging was getting tested! Once in the lee of Martinique, gone was the wind and a bit of motoring had to be done.